It’s time to give your alfresco dining a new lease of life. So away with the tried and tested burgers and baps, sausages and buns. And make way for…pizza. And I don’t mean a quick call to Papa John’s. You really can’t beat the taste of a pizza straight from a wood-fired oven: crispy, crusty, bubbling base, puffed up, fluffy crusts, crunchy toppings, gooey cheese, smoky taste. Fresh and hot and sizzling. Delicious. It really is the best way to eat outdoors with friends. Tong envy will be a thing of the past. 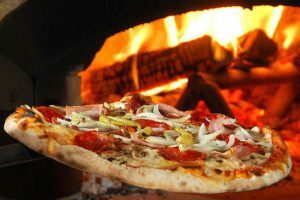 So Why Use a Wood-Fired Oven to Cook Pizza? With temperatures reaching approximately 450°C, a pizza placed directly on the oven floor can cook in under 90 seconds. At such high temperatures, the radiant heat from the fire and heat bouncing off the inside of the oven cooks and crisps the pizza very quickly. 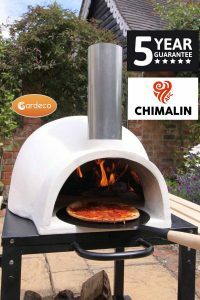 It seals off any moisture in the dough so it won’t become soggy and the result is a puffy, soft and chewy crust. The intense heat and constant airflow seals and cooks the toppings evenly and quickly so vegetables are far crispier than on a pizza from a regular oven. The speed of the cooking allows the vitamins and other nutrients in the vegetables to remain. And the cheese doesn’t burn. Thermometer – an infrared laser thermometer can safely be pointed anywhere inside the oven to read the temperature. Start the fire in the oven approximately one hour before cooking (time depends on size of oven) in the middle of the oven floor. 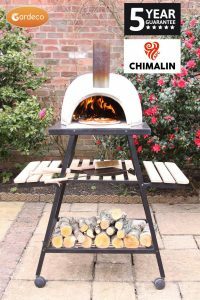 Build a good sized, hot wood fire from kiln dried, non-treated wood – it must reach optimum combustion temperature by using lots of kindling and only well seasoned wood. 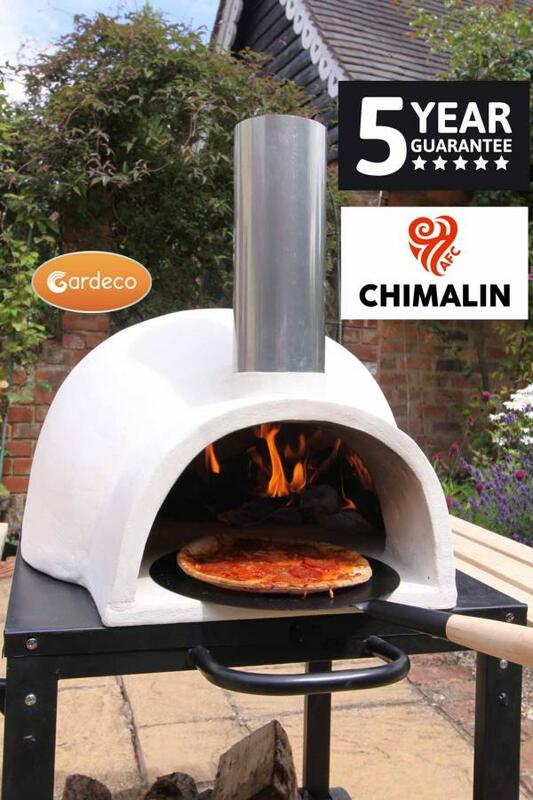 This method has the oven at its highest temperatures at approx 450°C which is excellent for cooking pizzas. Use single sheet scrunched newspaper, or a natural fire lighter, and place in the centre of the oven surrounded with stacked kindling. Light the newspaper and as the fire grows slowly feed the fire with more kindling (if flames are coming out from the opening of the oven, wait before adding more kindling). Depending on the size of the oven (leave longer if larger), leave the stack to burn in the centre of the oven for 20+ minutes to ensure the dome and the base are saturated with heat. As the oven starts to approach a high temperature, first add small logs and later on larger one. Your oven will approach its optimum temperature of about 450°C (check using an infra red thermometer aimed at the oven floor). Now move the embers and flames towards the side of the oven and maintain large naked flames which will arch over the dome of the oven. Keep the fire going by adding small pieces of firewood. Flour the peel and place the pizza on it. Make sure the pizza is not too big for the peel. Slide the pizza directly from the peel onto the oven base (this is where term ‘stone baked’ comes from). The crusts will start to puff up and start cooking immediately. Keep checking the dough nearest the fire as it may burn or catch fire. Tip – you can use the peel as a deflector and hold it between the pizza and the flames to protect it. After about 30 seconds slip the peel under the pizza and turn it to ensure you get an even crust – probably twice will be sufficient. When done, take your pizza out by sliding the peel underneath it. 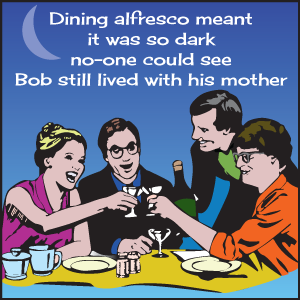 Then all you need to do is pour a glass of wine, eat and enjoy!